While San Francisco quarterback Colin Kaepernick created the latest sensation by dishonoring our flag, our military men and women who fought and died to make this a free country, and our national anthem—he represents a rip tide of angry, misguided and anti-American citizens or non-citizens growing in strength and numbers daily. If we celebrate another 10 million or 50 million Colin Kaepernicks, will we survive? “A knife-wielding 20 year old Somali man who was dressed in a private security uniform and made references to Allah while attacking at least nine people during a mass stabbing incident at the Crossroads Center shopping mall was shot dead by an off-duty police officer from Avon, Minn.,” authorities said. Another Muslim, Ahmad Rahami set off one dumpster bomb and two others that didn’t detonate in an attempt to blow up a 5 km race in New York City. At the same time that Europe flounders with its own immigrant invasion, presidential candidate Hillary Clinton promises to bring 110,000 Syrian refugees into America without any concern for Americans’ safety from terrorist attacks. All totaled, she expects to import 500,000 African immigrants. Annually, Congress imports 1.2 million legal immigrants without end and without question. Concurrently, Congress allows 500,000 illegal aliens to cross America’s borders without inspection or health checks annually. That’s the formula that added 100,000,000 (million) people into the USA since 1965. That’s why we face another 100 million by 2050. As American citizens watch their TV sets nightly, they see dramatic stories of sociological chaos in Europe as to immigration. They witness Muslim terror event after event in the USA such as 9/11, Orlando, Florida; San Bernardino, California; Boston Marathon and Chattanooga, Tennessee—without any call for a complete shutdown of all immigration. The mainstream press does everything in its power to disconnect facts and reality with political correctness, i.e., whitewash. Why do Americans stand by while watching their country tossed away like a bag of McDonald’s cheeseburger wrappers? At what point did we become a “throw away country”? Who gains by it? 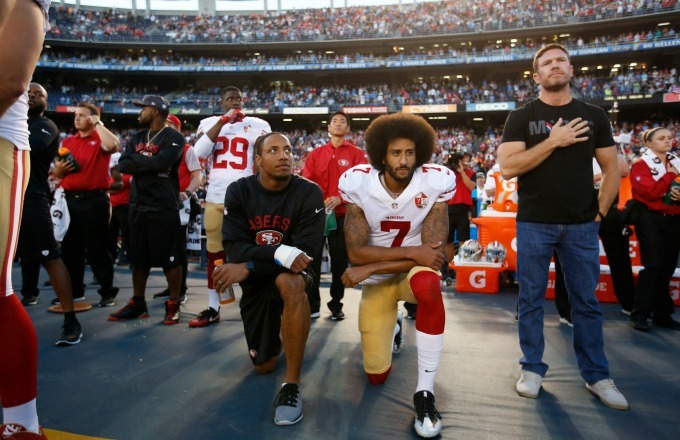 How does a failing civilization serve Colin Kaepernick? Why do Mexicans flee northward to America only to denigrate it? What lies behind Muslims’ arrival to insist on Islamic Sharia Law that stands diametrically opposed to our Constitution? Why have our Congressional members aided and abetted this U.S. invasion? These elected officials directly aid, abet and support illegal immigration: Senators Boxer and Feinstein of California; McCain and Flake of Arizona; Schumer of New York; Gardner and Bennet of Colorado; Reid of Nevada; McConnell of Kentucky; Hatch of Utah; Rubio of Florida and the majority of Congress—they make certain our border laws never see any enforcement. What drives liberals and the press to resist exposing clear markers of our immigration crisis? Why do they degrade one of the candidates when he stands for our borders and the rule of law? What will the elites and corporate brokers “get” out of a fractured and fragmented society accelerating toward civil war? America’s tombstone will read: “The one absolutely certain way of bringing this nation to ruin, or preventing all possibility of its continuing to be a nation at all, would be to permit it to become a tangle of squabbling nationalities. We have but one flag. We have one language, English.” Teddy Roosevelt. Today, we reap what they sowed as we face 100,000,000 legal immigrants thus far imported into this country from 190 different countries with 190 different worldviews, religions and cultures. They pull in their direction and against everything American. Colin Kaepernick’s black father abandoned him at birth, and his white mother Heidi Russo gave him up for adoption. He enjoyed a very modern upbringing by two white parents. Yet, he degrades our country that provides him incredible opportunities. Not mentioned in all the mayhem over police brutality against blacks, virtually none of the mainstream media reports the fact that 98 percent of all black killings stem from blacks killing blacks. Chicago, with 50 percent black population, features the highest current murder rates in America at over 500 homicides this year, to date. (Source: Scott Pelley, CBS News, 9/12/16) Over 60 percent of blacks quit school by 16 to become indigents, criminals and drug addicts. Three out of four black children arrive into this world out of wedlock and dependent on welfare by single mothers. Barack Obama or the Black Caucus accomplished little to solve that problem in the past eight years. Real changes could be realized in Chicago and other urban cities with dynamic leadership from Congress and the White House. As to Detroit’s overwhelming Muslim population: “Islam isn’t in America to be equal to any faith, but to become dominant. The Qur’an should be the highest authority in America, and Islam the only accepted religion on Earth.” Omar Ahmed, director of Council on American Islamic Relations. Because of unbridled immigration, America teeters on becoming a minority-dominated nation without a cohesive culture or language. In New York City with nearly 40 percent foreign-born people, immigrants speak 800 different languages. If we celebrate another 10 million or 50 million Colin Kaepernicks without allegiance to the USA, how will we survive? We accelerate into a fevered gallop toward a crumbling destiny. Vote for Donald Trump! If enough of us vote for him, we can turn the tide. See… Democrats are a political party. they are a mere drop in the bucket as compared to the Silent Majority’. Muslims have no place in America. they hate us all because we refuse to get down on our knees and pray to Allah The Evil. The November Election will decide our future.